My usual approach for getting to DC involves simply flying to DCA (the now cumbersomely-named “Ronald Reagan Washington National Airport”) since it’s generally pretty affordable, on the Metro, and walking distance from Crystal City. But for this trip I had a bunch of Southwest points to burn, so we booked our travel through BWI. BWI is reasonably good for trips to DC, although there’s a bit of “planes, trains, and automobiles” involved, with taking a bus to the train station, following by taking an Amtrak or MARC train to Union Station. But one notable feature of this trip is that you get to visit Union Station. Originally one of the more majestic train stations in the US, like most major train stations by the 1950s it was in massive disrepair, although a major effort in the 1980s resulted in a restoration (I’ll spare you much of the history here, and simply refer you to Wikipedia). Part of that restoration involved converting part of the old baggage handling level into a large food court to go along with the other retail in the station, so the bottom level of Union Station has almost 20 restaurants crammed in. Now, like the food court at your local mall, most of these places aren’t really any great shakes, since most of these are places like Burger King, Subway, and The Great Steak and Potato Company. But hidden amongst those food court stalwarts are a few local small business gems. 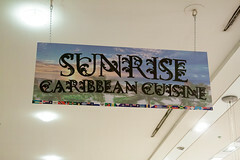 One of them that caught my eye was Sunrise Caribbean Cuisine. While the basic approach at Sunrise Caribbean is “pick a protein and several sides from the steam table” sort of service, I’ll have to say, they’ve got a pretty good selection of options. When I was there, in addition to the requisite jerk chicken, they also had curried goat, curried chicken, stewed oxtail, jerk shrimp, and salmon curry. And a few puzzling ones, like “Sweet and sour chicken” being listed under Vegan, although I’m guessing that’s a case of missing quote marks. Alongside those choices is an impressive list of sides, everything from rice, to fried plantains, to black beans, chickpeas, collards, and callaloo (a simmered dish made from amaranth leaves). I ended up going with a “small” order of a pretty standard set of Jamaican dishes: jerk chicken, curried potatoes with chickpeas, and rice and peas. Well, I’ll have to say, for their $6.95 price, the “small” order of Jerk Chicken was a surprisingly ample portion of jerk chicken and sides, almost spilling out of the styrofoam container. I was quite pleased with the jerk chicken: the chicken itself was quite moist and flavorful, and the jerk sauce bold, spicy, and tangy. While for me one of the things I enjoy about a good jerk is the crispiness, that usually doesn’t lend itself to the steam table service of places like this, but this jerk chicken held up well. 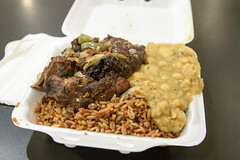 The rice and peas were rather nicely done and flavorful, with a bold black pepper note, and the curried potato/chickpea mix also had a very flavorful and gingery sauce. Overall, I was very pleased, with the food being flavorful, bountiful, and cheap all at the same time. The flavors were pleasant enough that I honestly think that if you go to most of the other places in the food court, you’ve wasted a nice opportunity. Sunrise is far better than your average food court fare.